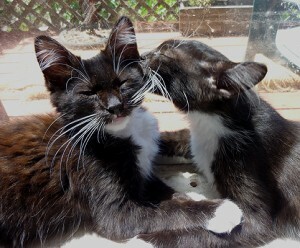 Welcome to Part 2 of my interview with Cynthia Burke, the devoted founder and owner of Bee Holistic Cat Rescue and Care in Northern California. Here, Cynthia talks in more detail about keeping the right perspective when times get tough, how she feeds her cats, and shares final words of wisdom. Liz: It must really take a strong heart to care for all these cats in various conditions. I’m sure it’s rewarding, but it must be hard to care so much about so many animals. Cynthia: Well…there’s a fair share of heartbreak for sure, but it’s not something you need to focus on or dwell on. You need to not let that slow you down or interfere. Don’t let that be your dominant focus…it doesn’t do anybody any good. You’ve got to use your energy in a positive way, praise them, and encourage them, and love them. You know there’s times when you wish you had done more…but you learn from them. You know, I’ve had cats that I might have felt sorry for—it’s hard not to when they are disabled in one way or another. But they don’t feel a bit of self pity ever, so it’s a lesson for us just to accept what is given. 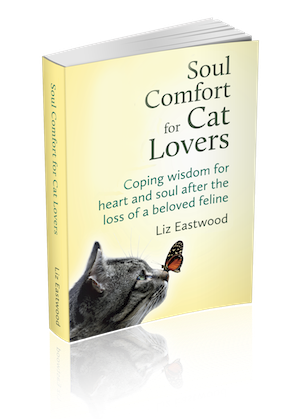 Liz: When my cat died of high-grade lymphoma, it was very hard–a major motivator for me to get really serious about natural cat care and preventing cancer. It’s easy for me to think “how could I not have saved her, and how did I not prevent it?” But I have to remember I did so much…. Cynthia: You did your best, that’s the bottom line, and I’ve followed that principle in life: We all do our best no matter how imperfect it is. And we have to remember that. Liz: You do your best with what you have–and with what you know at the time. Liz: Tell me about what you feed the cats. Cynthia: I feed them real food, not food that’s been genetically modified or full of poisons, just food. Good healthy fresh food. I have on my website a very specific breakdown of what I do and what I put into it, and the fact that you need organs as well as meat and that it’s better raw, and so on. I feed raw organic. Mostly chicken because it’s more affordable, some beef. I usually include 5-10 % of fresh organic vegetables and or fruits. Cynthia: Right. There are a lot of good supplements, and I don’t feel that I know all there is by a long shot. I do extra things as needed — like right now Dillon’s got a cold so I’m putting extra Vitamin C in everybody’s food to prevent others from getting it. Sometimes I’ll put more fish oil. I’ve been using more seaweed these days because of the radiation. It just depends on what’s in the household and what someone needs. Liz: Can you envision readers traveling long distances to adopt from Bee Holistic? Or is that too hard on the cat? Folks do come from Santa Rosa, Petaluma, Marin, etc. They find the drive worth it. But [for further distances], I would tell them to just find a cat where they are. There’s plenty of wonderful cats. They don’t need to drive. They can turn any cat into a healthy cat pretty easily, so there’s no need to come here and get one of mine, although I’d love to find homes for them. You know, there’s cats getting killed in the shelters everyday where they are. Liz: Thank you, that’s actually a good piece of inspiration: You can find a cat where you are and you can do what Cynthia does to help them be healthy. Thank you, Cynthia. All photos in this series are courtesy Bee Holistic Cat Rescue and Care. 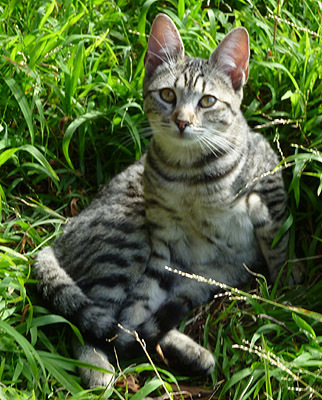 Cynthia invites people to visit her site and even to call her if they have questions about holistic cat care!